Credit: V.Springel, Max-Planck Institut für Astrophysik, Garching bei München. The distribution of matter in the Universe is not homogeneous, but is distributed in a network of knots and links. The knots are regions where the gravitational forces are higher. These knots are then connect to others through filaments. 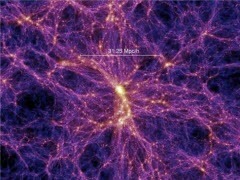 Researches call these large-scale structures in the Universe the “cosmic web“.